Multi-Stream Transport (MST) technology uses your existing video card to minimize the use of system resources while delivering UHD 4K resolutions for up to two monitors simultaneously. Plus, because the multi-monitor splitter can output HD 1080p on three independent displays, it’s perfect for all high-resolution applications such as graphic design and medical imaging. MSTCDP123DP is backed by a StarTech.com 3-year warranty, and free lifetime technical support. Note: MST shares 21.6 Gbps across all attached displays. Higher resolutions can restrict the available bandwidth with the remaining ports, please see our guideline below for determining an ideal resolution for your setup. What is an MST hub, and how can I tell if it will work in my setup? You may have heard of MST hubs, and have been wondering what they are, and whether or not they will work in your setup. So what are MST hubs? 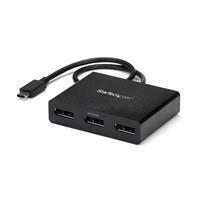 MST hubs are devices that take one DisplayPort or Mini DisplayPort video connection, and go to many video connections, usually extra DisplayPort, Mini DisplayPort, DVI or HDMI connections. This is accomplished through DisplayPort's MST, or Multi Stream Transport function. 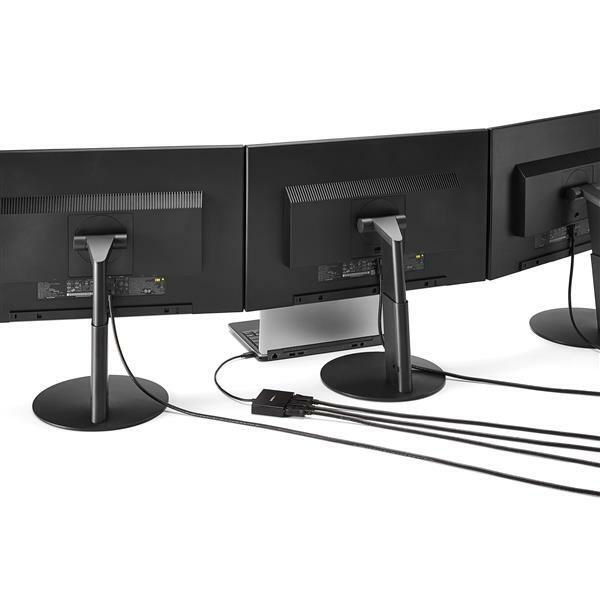 MST hubs allow you to mirror / duplicate your monitors so the same window are shown on all of the monitors, or extend your desktop, so that you can have different window on each monitor. So how can you tell if you can use a MST hub? MST hubs require that the video card's DisplayPort or Mini DisplayPort output support DP1.2 or greater, which supports MST. Some MST hubs also specifically require HBR2, or High Bit Rate 2 support. HBR2 allows for higher resolutions like 4K and up. You can check whether or not a StarTech.com MST hub requires HBR2 on the individual product pages, under the Technical Specifications tab. There are a few other important things to note. Video cards can technically support DP1.2, but not support MST or HBR2, so it is important to check with your video card manufacturer that your video card specifically supports DP1.2, MST, and HBR2 (if necessary). Currently Mac OSX does not support MST hubs, regardless of whether or not the video card does. This is an operating system restriction, so running Windows on an Apple computer through a program like Bootcamp will allow you to use MST hubs. Will this MST hub work in Mac OSX? 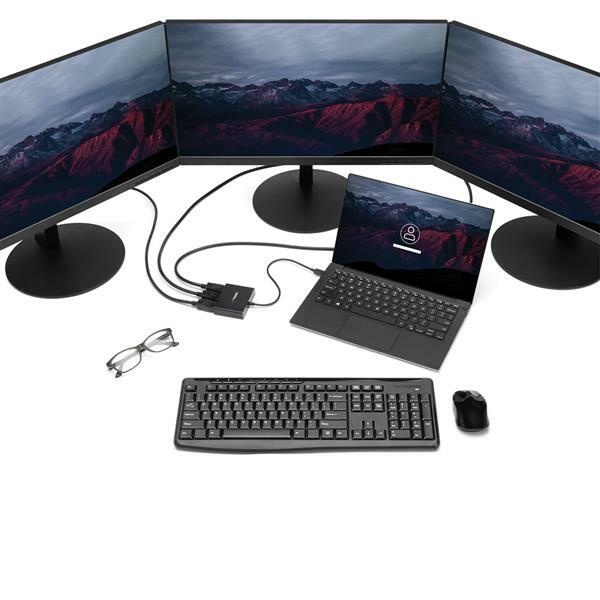 Recent versions of DisplayPort include the ability to split to multiple displays from one DisplayPort connection using Multi-Stream Transport (MST). Although you will be able to connect the MST hub to the Mini DisplayPort (mDP) connection on your Mac, Mac OSX does not support MST for NVIDIA and Intel Graphics Processor Units (GPUs). This results in a mirrored image across the outputs of a MST hub and you will not be able to have multiple independent displays on your Mac. The limitation of NVIDIA and Intel GPUs lies within Mac OSX. If a different operating system is used, such as Microsoft Windows via Bootcamp, you may be able to use the MST functionality of your Mac. Should I use passive or active video signal converters with this MST hub? When you convert from DisplayPort to DVI or HDMI, it works best if you use passive video signal converters with StarTech.com MST hubs. The MST hub has the capability to convert a video signal DisplayPort to a DVI or HDMI video signal as long as a video signal converter is used to change the connection type. This is because DisplayPort 1.2 (DP 1.2) supports both MST (Multi-Stream Transport) and Dual Mode (DP++). 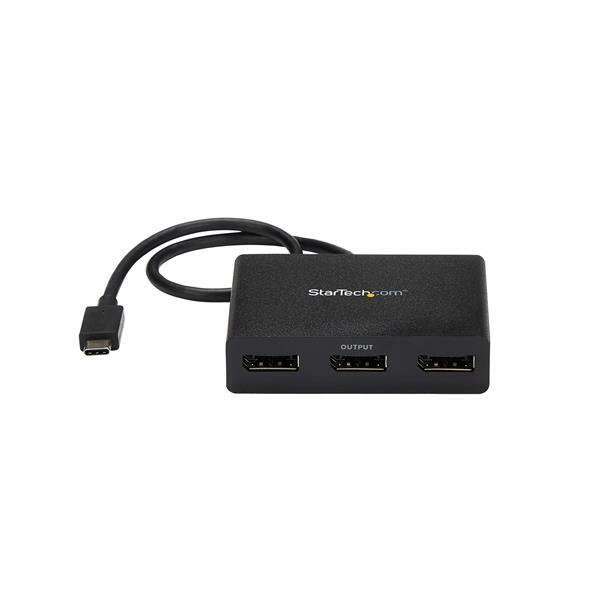 For more information, refer to the following FAQ: http://www.startech.com/faq/displayport_converter_dp_multi_mode. 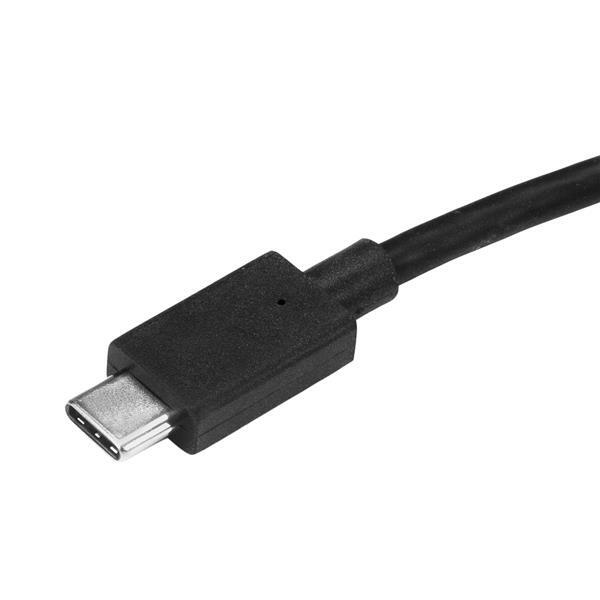 When you convert from DisplayPort to VGA, you must use an active adapter because DisplayPort uses a digital signal and VGA uses an analog signal, and the MST hub cannot convert from a digital signal to an analog signal. Note: When you use a StarTech.com video signal converter to convert from DisplayPort to VGA, you should use the DP2VGA3. In certain circumstances, the DP2VGA2 has compatibility issues with certain VGA monitors. If you experience issues when you use a Surface Dock to connect passive video signal adapters to an MST hub, Microsoft recommends that you use active video signal converters instead. 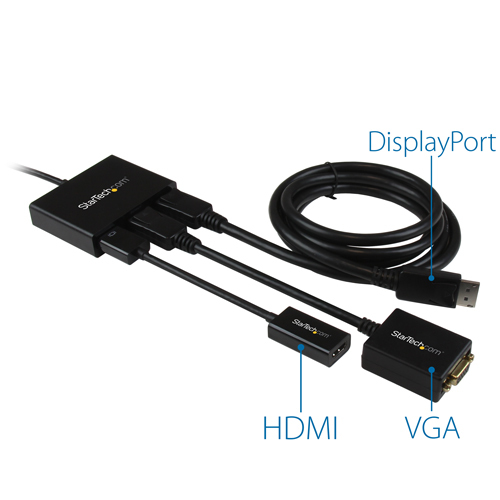 StarTech.com offers an active video signal converter for DVI monitors (DP2DVIS) and for HDMI monitors (DP2HD4KS). Will this MST hub allow me to get around my video card's maximum number of displays? You cannot use an MST hub to increase the maximum number of displays that a video card supports. For example, if your video card only supports up to three displays, your display limit will still be three displays even if you use an MST hub. If you have multiple MST hubs connected to the same computer and are experiencing display issues, you should check your video card to make sure that it can support the number of displays that you are using in your setup. If you use an MST hub in your setup, your video card also needs to be compatible with MST technology. For more information, refer to the following FAQ: https://www.startech.com/faq/mst-hubs-gpu-compatibility. How do I set up my MST hub? Plug the MST hub into a compatible DisplayPort 1.2 output from your computer. Plug the power into the MST hub. Plug your DisplayPort monitors or DisplayPort adapters/converters into the MST hub. You should be able to detect the monitors in the display properties of your operating system. Verify that the latest display drivers are installed. Press and hold the Scan button for five seconds on the MST hub. When the monitors are detected in the display properties of your operating system, make sure that the resolutions that you are setting do not exceed the total data throughput of the DisplayPort host connection. You can verify the total data throughput (bandwidth) under the Product Overview tab for you device. Use the video cables, video source, video destination, and MST hub in another setup to see if the problem is with the components or the setup. Use a different video cable, video source, video destination, and MST hub in your setup to see if the problem persists. Ideally, you should test a component that you know works in another setup. Eliminate the use of adapters, extenders, or splitters where possible. Make sure that the computer/graphics adapter is MST compatible. 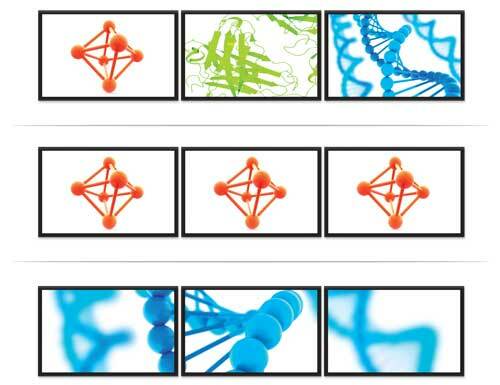 For more information, refer to the following FAQ: http://www.startech.com/faq/mst-hubs-gpu-compatibility. Make sure that the latest graphics drivers are installed. The latest drivers are available on the website of the manufacturer of the graphics adapter. Use compatible adapters. For example, DisplayPort to HDMI and not HDMI to DisplayPort. Note: Drivers are not required for the MST hub. On your keyboard, press the Windows key + X and click Control Panel. In the left column, click Resolution or Adjust Resolution. Your monitors will be displayed as numbered icons. To see which monitors are detected, click the Display menu. To display the numbers on each of the connected monitors and see how the operating system has assigned their positions, click Identify. My monitors are flickering when used through my MST hub. What do I do? Right-click anywhere on your desktop. Click Screen resolution or Display settings. At the top of the screen, select the monitor that you want to change the refresh rate for. Click Advanced settings or Display adapter properties. On the Monitor tab, click the Screen refresh rate drop-down list. Note: This step may vary depending on your operating system and graphics card. Some or all of my monitors are not waking up after my computer or tablet comes back from Sleep mode. What do I do? If the displays connected to your MST hub do not wake up after your computer goes to sleep, change the input on the monitor(s) from Auto to the correct input (for example, DisplayPort or HDMI). This prompts the monitor to send its identification data to the correct port instead of scanning for ports when the signal is lost. After you select the correct input on the monitor(s), press the Scan button to initiate the handshake (EDID) process. For more information on the Scan button, refer to the following FAQ: http://www.startech.com/faq/mst-hubs-scan-button. Note: Depending on how you have the View by options set in Control Panel, you might have to click Hardware and Sound to see Power Options. Click Change plan settings for the plan in use. For both entries, change Put the computer to sleep to Never. (5 stars) Works perfectly with Linux. I bought this to allow my HP ZBook G3, running Linux (Kubuntu 18.10), to drive three Samsung 1920x1200 DisplayPort monitors. The display multiplier worked perfectly out of the box. It allowed the ZBook to drive all three screens, plus the laptop's own 1920x1080 screen, making four in total, with no discernable performance impact and no glitches or problems. Linux detected the additional monitors automatically and the KDE desktop made it trivial to arrange them as desired, and to disable the laptops screen so that I could close the laptop and use only the other three. (Depending on your distro you may need to add your user to some groups in /etc/group.) All in all - an excellent product that does exactly what it claims, does it well, and does it with no fuss or problems. As with all StarTech kit the build quality looks pretty good. Well worth the money. I received this in exchange for providing an unbiased review. I'll admit I'm a big fan of StarTech products but I do my absolute best to stay totally objective. Packaging is excellent. It's not overdone, not too minimal to protect the product in shipping. It's also not so overdone that you are left with extra boxes. Not germaine to this particular product but it's part of the experience. Unboxing takes seconds, literally. It couldn't be easier to simpler. The design is so intuitive the most difficult part of the process is finding the USB C adapter on your computer or finding the right chords to hook into your monitor. I use a HDTV as my main monitor along with three other ones, but I had an older flatscreen in one of the rooms that I try to use. Running through each adapter port, the resolution was as good as any other connector or bridge. The only problem I had was with some display drivers for one of the monitors that needed to be installed before it worked. But this was b/c of the operating system, nothing related to this hub. Just figured I'd mention it. The main reason I am such a big fan of StarTech products is the design and build of the products. If you are looking to pay a little more to get a lot more quality, you'll always get the quality with them. This is no exception. It's firm, strong and can withstand wear and tear. The only even small issue design wise was that one of the Ports was a little too tight. MOst of the time the fit is perfect, snug without being too snug. In any case, this one port got better with use and it only took about 5 insertions to make everything fine. All in all, this is so easy to use, takes no time to get up and running, has a cycle time of about 1 minute to be useful and it's just built really well.